Plenty tips about growing and cooking with Basil in the Spice It Up segment with herb and spice guru Ian Hemphill,; get those cucumbers growing in Vegetable Heroes; Festive red flowers but are they in Plant of the Week and which fence for your garden in Design Elements? At one stage the Greeks and Romans believed the most potent basil could only be grown if you sowed the seed while ranting and swearing. Maybe that’s why the French say semer le baslic (sowing basil) means to rant. Herbs take on a different flavour when they're dried, because they lose their top notes. Dried herbs are best added at the beginning of cooking so that they have time to infuse the dish with their flavour. Fresh herbs on the other hand, need to be added at the very last minute so that their flavour doesn't disappear in cooking. 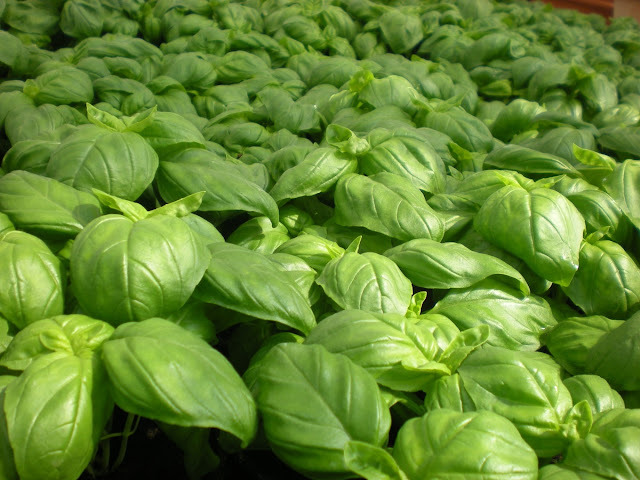 If you live in arid or sub-tropical regions you can sow Basil in late august in a mini greenhouse or indoors, but otherwise you can sow right through to December which is the best time to sow Basil seeds. Cucumbers just love the hot weather, so they’ll germinate and grow quickly at this time of the year. Cucumbers are a member of the gourd or cucurbit family and have been grown for 4000 years! Did cucumber start off in India? Who Ate Cucumbers Throughout History? Some pretty famous people have been known to be fans of cucumbers, even cucumber pickles. Take, Julius Ceasar, he ate them everyday, Cleopatra, thought cucumber pickles helped her skin complexion, and other pickle lovers included George Washington and Queen Elizabeth 1. Would you have thought that Cucumbers are one of the world’s favourite vegetables? I would’ve said the tomato, but there you go. 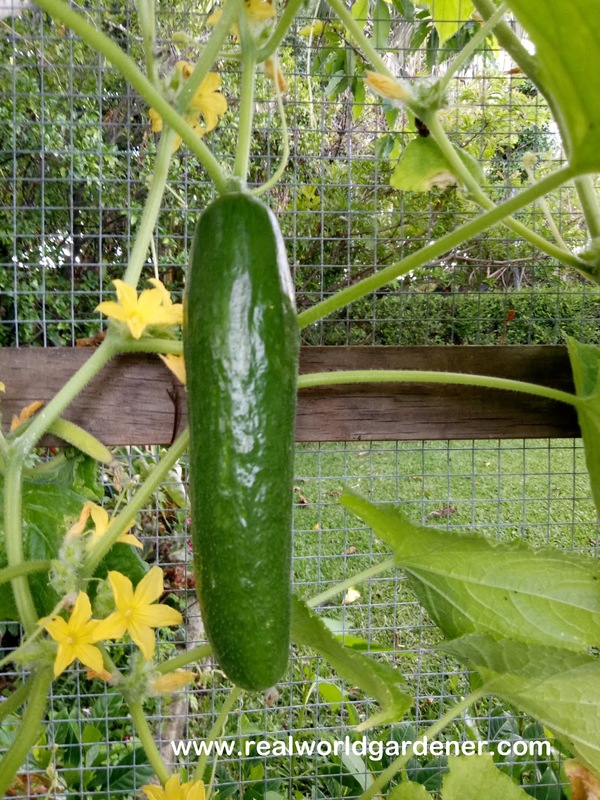 When is the best time to grow some cucumbers? Cucumber plants do best in all types of temperate and tropical areas and generally need temperatures between 15-33°C. For this reason, they are native to many regions of the world. Sow the seeds of Cucumber in late Spring and early Summer for cool temperate districts, spring and summer for arid and temperate zones districts, from August until March in sub-tropical areas. Only the cooler months for tropical areas-so April until August unless you’re inland. And where can you grow these delicious cucumbers? 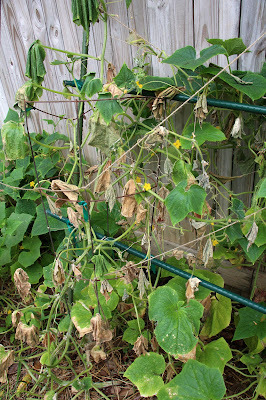 You need to pick a sunny, well-drained spot, because Cucumbers are a subtropical plant, that needs full sun. 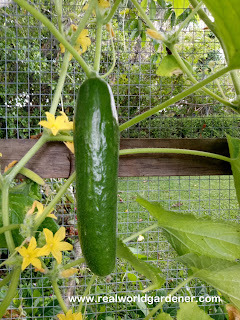 Cucumbers also want a decent amount of growing space in your garden. 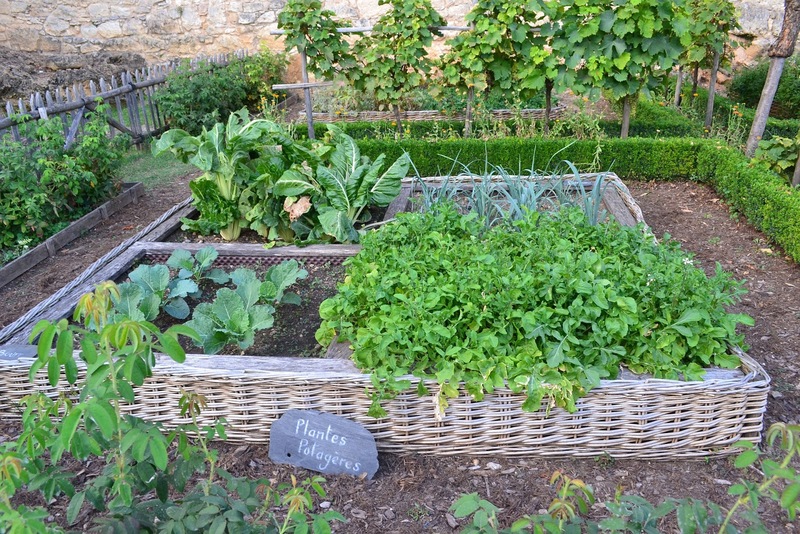 If you’re short on space, try growing them up vertically on a trellis or even on some netting, perhaps a tomato trellis? In fact, growing up a trellis would be a great way to avoid all the mildews and moulds that cucumbers are prone to in still humid weather. There’s also a number of dwarf varieties if you’d like to grow your cucumbers in pots. Or you could try Cucumber Mini Muncher as well. You’ll need to go to a seed mail order place for those, or if you’re in Adelaide, go to the shop in the Botanic Gardens. The best thing is that Cucumbers aren’t picky about soils. However, do you find your Cucumber seeds sometimes don’t germinate? and if you keep it too wet, then the seed rots. If this keeps happening, try using another type of seed raising mix, or even some good quality potting mix and try again. What cucumbers like is soil that’s well-draining and has a pH of around 6.5. Add in plenty of organic compost and fertilisers like chook poo or cow manure. When your seeds have germinated, pick out the strongest couple and throw away the others so you don’t get overcrowding. When your cucumber has gotten going, water it regularly at the base of the plant, that way the leaves stay dry and you lessen the chances of the leaves getting the white powdery stuff growing on them, powdery mildew disease. Powdery mildew is a fungal disease that is spread by spores carried by the wind. Look for white to grey fungal deposits on the leaves and stems of your cucumbers. 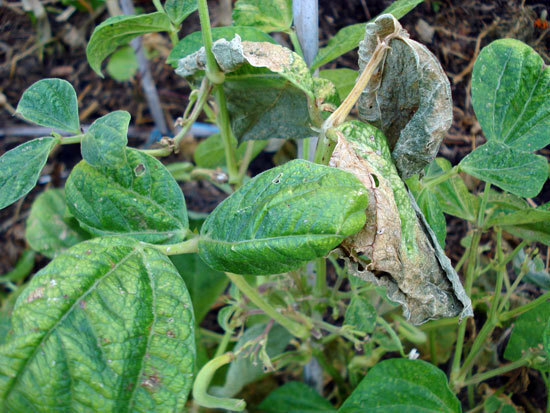 As the mildew spreads, the leaves become brittle then start to die off. There are some types of cucumbers that resist this disease for a time anyway. You can also try a natural fungicide. 1 part whole milk to 10 parts water, and spray in the cool of the day. Don’t forget to feed your cucumber plants every couple of weeks with a soluble plant food. There’s so many now on the market, an some come with seaweed added into them as well. Who out there hasn’t tried a cucumber that’s tasted bitter? I’m sure some time in your life, that’s happened hasn’t it? One theory is that the bitterness is caused early in the plant’s development by terpenoid compounds that give a bitter flavour to the entire plant. Usually the bitterness accumulates at the stem and below the surface of the skin of the cucumber. According to this theory it’s a genetic problem. Newer cucumber hybrids seem to have fewer problems with bitterness. I’ve always thought it to be the result of Cucurbitacin. Found in most cucumber plants, Cucurbitacin causes fruit to taste bitter. Cucurbitacin levels increase when a plant is under stress, and can make the fruit taste really bitter. The concentration of these compounds varies from plant to plant, fruit to fruit, and even within the individual fruit itself. Did you know that the ability to taste detect bitterness or cucurbitacins also varies from person to person. Even insects have varying preferences for cucurbitacins- the compounds attract cucumber beetles but repel other insects, such as aphids and spider mites. Anyway, it proves that you shouldn’t stress out your cucumbers! By the way, if you do get a bitter cucumber, peel it and cut of the ends by about 2.5cm, that’s where the bitterness concentrated. Just like zucchinis, cucumbers have separate male and female flowers. Male flowers come out at first, but don’t worry too much because the female flowers will arrive soon after. Cucumbers should be ready at about 50-60 days and picking fruit often stimulates more to start growing. Some of you probably have realised that if you pick your cucumbers when they’re quite small, this is when they’re at their sweetest. Twist the cucumbers off the plant or cut the stalk just above the cucumber tip. Cucumbers have lots of Vitamins C but why you should eat them is because the silica in cucumber is an essential component of healthy connective tissue, you know, like muscles, tendons, ligaments, cartilage, and bone. Cucumbers have some dietary fibre and Cucumber juice is often recommended as a source of silica to improve the complexion and health of the skin, plus cucumber's high water content makes it naturally hydrating—a must for glowing skin. 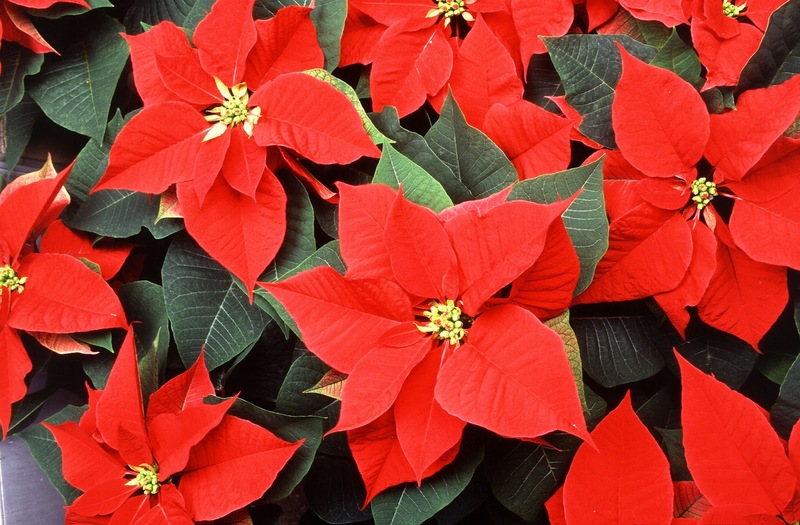 Poinsettia plant’s leaves were used by the Aztecs to make red dye and the plants’ milky white sap was also used to treat fevers. Great for festive decorations and considered a must have at certain times of the year. The bloke that this plant was named after also founded the Smithsonian Institute in America. 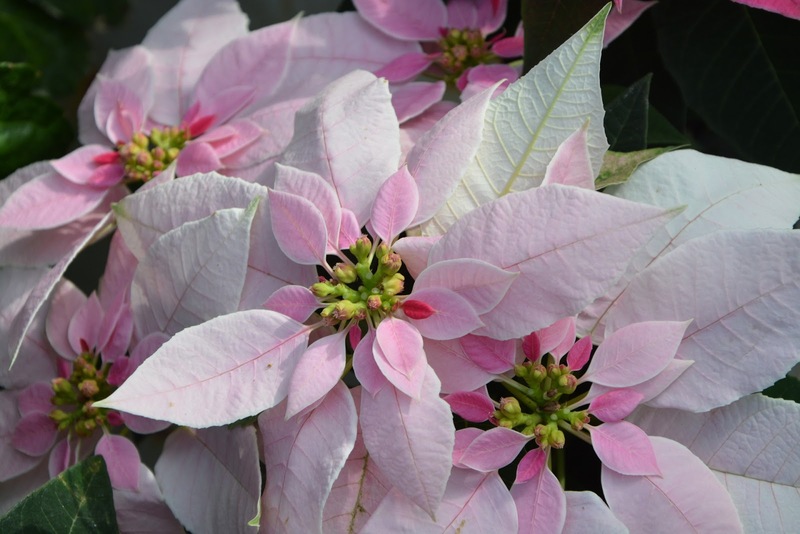 Unless you've purchased a "Princettia" Poinsettia which is a genuine dwarf cultivar, the others will grow much taller if planted out. The species Poinsettia, will grow to over 3 metres tall in the garden. Those that are sold at Christmas time have been sprayed with a dwarfing compound. Did you know that also that the American Congress honoured Joel Poinsett by declaring December 12th as National Poinsettia Day which commemorates the date of his death in 1851. Poinsettias can be grown south of Brisbane right down to Coff's Harbour, and north of Brisbane they will grow as far as the land extends, although they can be difficult to grow in frost prone areas west of the coast. They can also be grown in warm parts of South Australia and in Western Australia's coastal regions, particularly in the north. Which Fence Style For Your Home? What type of fence have you got and does it need replacing? Paling fences seem to be de rigour, but there’s no need to settle for that because you’ll be looking at it for a long time. 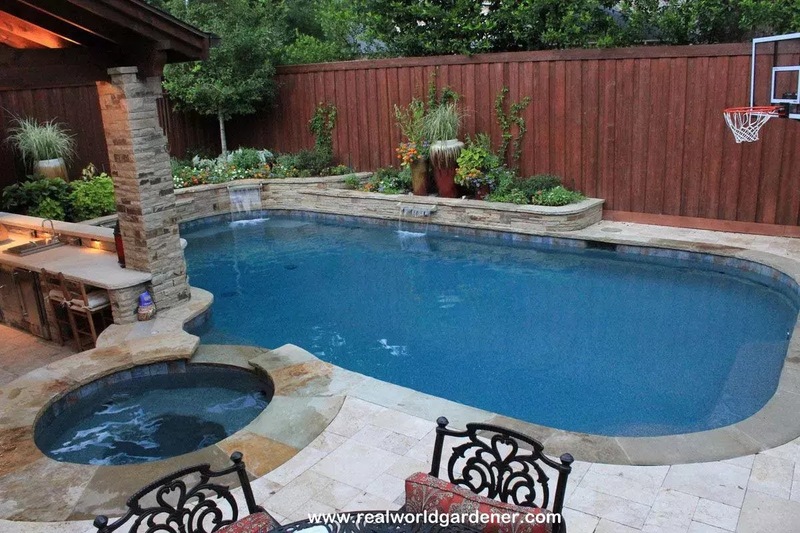 What are the things you should consider though before deciding on a fence? I'm talking with Lesley Simpson garden designer. Just goes to show that you don’t have to be limited with the type of fence that you can have for your garden? If you’re stuck with a grey looking paling fence, you can always zhoosh it up with some bamboo screening. Find out what "forest bathing" is all about with one of the few guides in this feature interview.Plenty of violet flower but what to do with them in the Good Earth segment,; how do pineapples really grow in Vegetable Heroes; succulent arrangements in Plant of the Week. Sounds like a skinny dip in the lake, but that couldn't be further from the truth. It's all about immersing yourself with nature and reconnecting. Not a bushwalk or a walk in the park, but an opportunity to slow down and allow nature to enter your body through all the senses. Sound a bit far fetched? I'm talking with Louise Kiddell, a certified Nature and Forest Therapy Guide, one of the few in Australia. 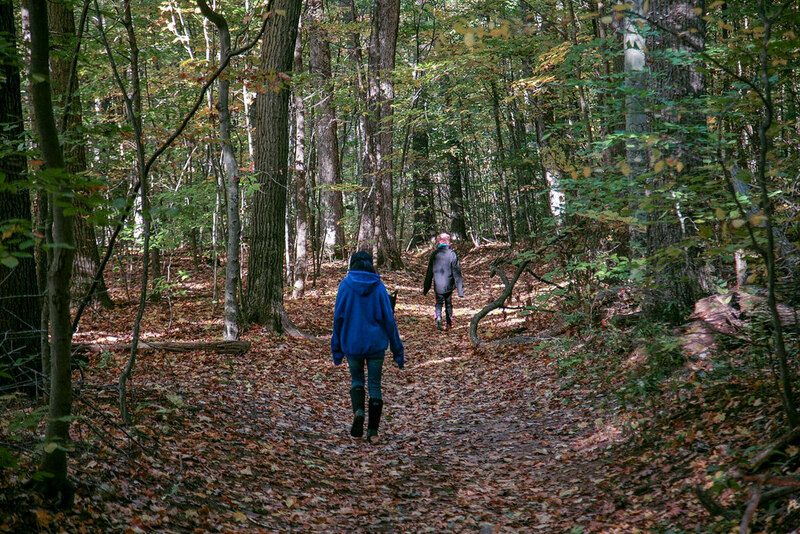 It all started in the 1980's in Japan called "Shinrin Yoku" which translates as "forest bathing." Think of it as another form of yoga. Just as with yoga, you can practise it alone but it helps immensely if you start with a guided walk to get you onto the right path, so to speak. 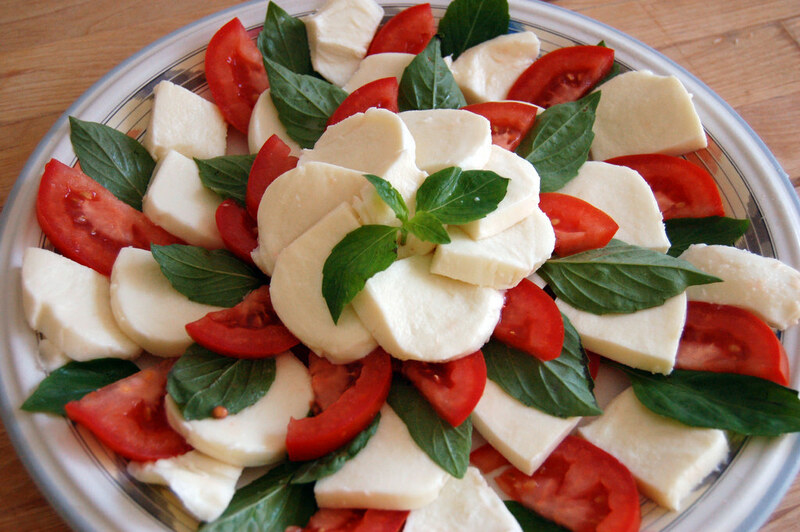 Some flowers lend themselves easily to uses in the kitchen. Some decorative but others quite edible. 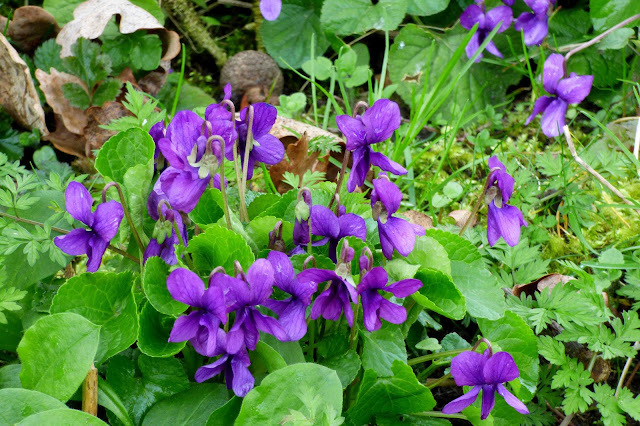 You might not know that this species in particular , sweet violet (Viola odorata, Violaceae) is the principal medicinal and culinary species used in Europe. But apart from the fragrant, albeit very small flowers, there’s quite a few other things you can do with them. You can use the petals fresh in salads, just remove the other parts of the flower to avoid that bitter after taste. Preserve the petals with gum Arabic or egg white. Paint the flower petals with an artists brush and then dip it into something like caster sugar. Dry them face up on paper and either use them straight away or store in a jar for up to 2-3 months. You can also preserve the petals in honey. Preserving them this way will help with dry coughs and even asthma possibly. Leave to ferment for a couple of months. The sugar converts to acetic acid so it's not bad for you. In the first month open and stir every day. The pressure will build up in the bucket (particularly in warm weather) and needs to be released. This is also why flexible vessel needs to be used – a glass jar can shatter under pressure. For the next two months stir occasionally. You will see a film of yeast and bacterial blooms showing on the surface. This is normal and as the mixture becomes more acidic, these cultures will die. After three months in the bucket, strain/filter the liquid into plastic bottles for storage and compost the solids. Pineapple or Ananas comosus from the Bromeliad family. I wanted to talk about pineapples not many people are aware how they grow. Would you have thought that the pineapple came from a tree, perhaps a palm tree? Pineapple is native to South America and was given its English name because it looks like a pine cone. Christopher Columbus brought this native of South America back to Europe and later on sailors brought the pineapple home to New England. There is a tale that goes where a fresh pineapple was displayed on the porch meant that the sailor was home from foreign ports and ready to welcome visitors. Did you know that in 1723 England, a huge "Pineapple stove" needed to grow the plants wasw built at the Chelsea Physic Garden. The garden still exists today, but I never saw this Pineapple Stove when I was there a few years ago so I assume it’s gone. Did you also know that the pineapple is a multiple fruit? This means they grow from a cluster of fertilized flowers that join together. 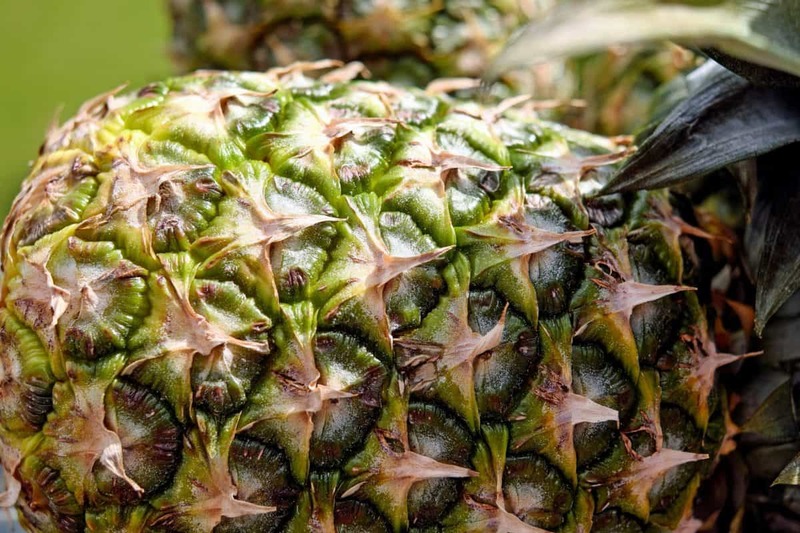 The fruitlets are also known as the eyes of the pineapple; that’s the rough spiny marking on the pineapple's surface and there are approximately 150 on each mature pineapple. Firstly, the pineapple plant is one of the few tropical fruits that are really well suited to growing in pots, and that means you can grow pineapples indoors. That also means that you can grow them anywhere in Australia, really. Secondly, if you plant them in the right spot they need virtually no care whatsoever. So what are the pineapple plants’ requirements? 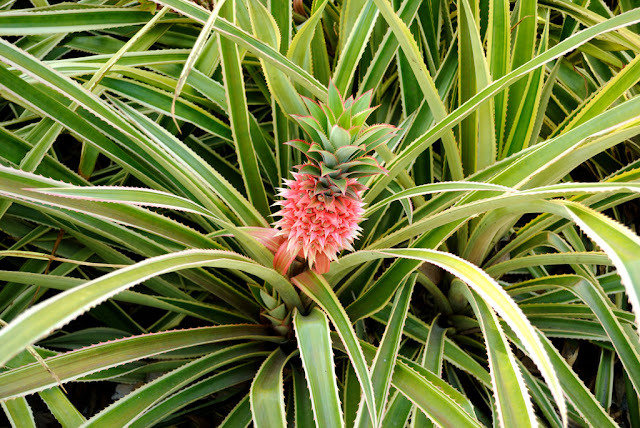 The pineapple is like a lot of Bromeliads in appearance, with blue-green sword shaped stiff leaves. In general, Pineapples are best suited to humid coastal districts in tropical and subtropical regions of northern and eastern Australia. But in a warm, sunny, sheltered and frost free position, they will cope with cool nights for short periods. Tip: One thing most Bromeliads don’t like is frost. Remember that pineapple plants are bromeliads. Like all Bromeliads, some can take sun and some prefer dappled shade. Usually the hardness of the leaf will indicate which situation the Bromeliad you have likes. 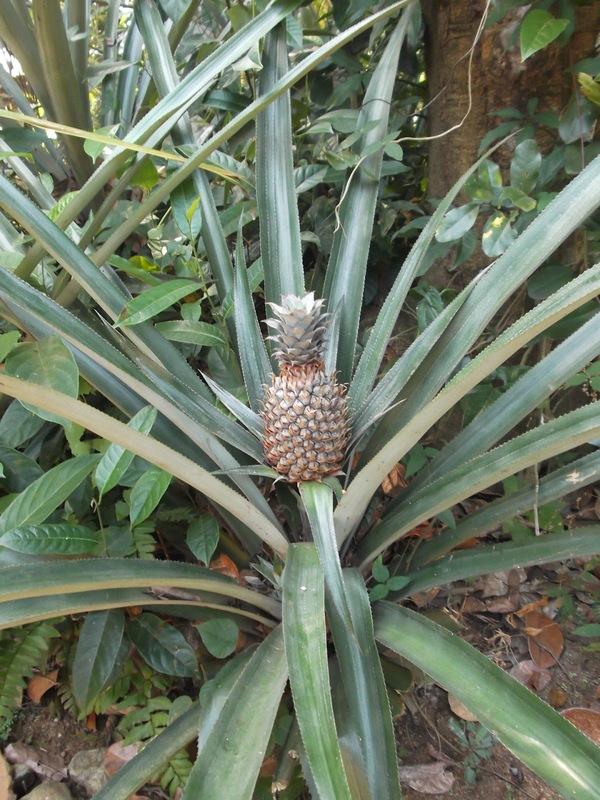 We all know that the tops of pineapples are very stiff and prickly, so that gives you an indication that Ananas or the pineapple Bromeliad can take full sun, but surprisingly, it will grow in dappled shade as well. 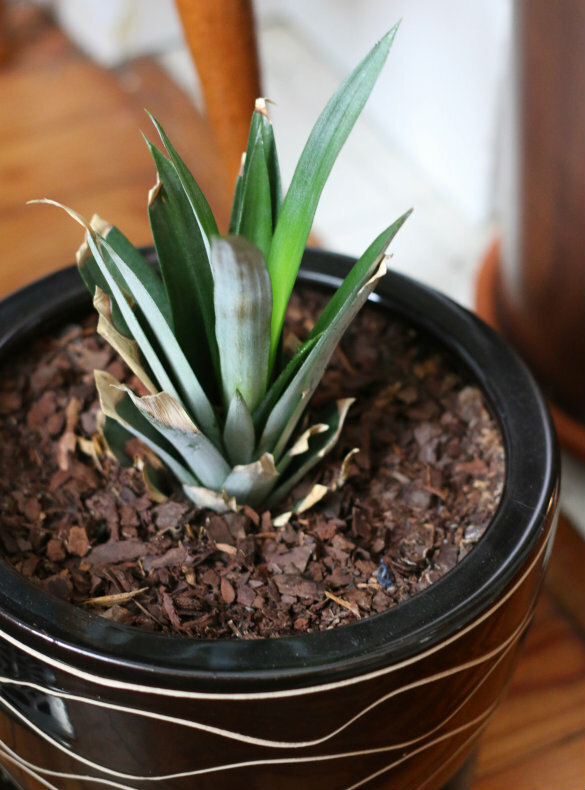 And like a lot of Bromeliads, you don’t want to overwater your pineapple bromeliad, because you may cause it to rot. Bromeliads don’t like soggy waterlogged soils but can get by on very little water except of course during extreme heat waves. In that instance you may want to cover any Bromeliad you have with an old sheet to prevent leaf scorch. One way to grow your pineapple and this comes from Mick in north Queensland who says, that he has never actually bought a pineapple plant. He just plants the top of a pineapple. They don’t fruit usually in the next spring/summer but the one after, and some have taken an extra year. Each plant will fruit once a year and then throw a pup, the mother will then die and a year later the pup will fruit. Another way to grow pineapple plants, more so for gardeners in tropical areas is if you know someone who grows pineapples you may also be able to buy some "suckers" or "slips" (little plantlets taken of a mature pineapple plant). After the first fruit is produced, side shoots (called 'suckers' by commercial growers) are produced in the leaf axils of the main stem. You can pull these off to propagate new plants or just let them stay on the parent plant and keep widening. Paul says, that he also found (maybe coincidence) that ones in pots fruited quicker than ground but they would be nice and hot all the time. Pineapple plants grow up to 1 ½ metres high and wide, pretty much like the Giant Bromeliad, Alcantarea. If you’re growing the top of a pineapple make sure you remove all the fruit flesh. You should also remove all the small bottom leaves. Just pick the lower leaves off so you have a bit of a stem to plant, then leave the pineapple top in the shade of your verandah to dry out for a week. The same goes for suckers. If there are very small or dead leaves at the bottom pull them off. There’s no need to bury the pineapple top in the ground. Just make a small depression in the ground or in a pot and stick your little pineapple in that. Push the soil back in and firm it around the base so the pineapple sits straight and doesn't fall over. You can use a couple of small sticks each side to keep it upright until your plant grows some roots in about six weeks. Mulch around the plant to stop it drying out too much. If the soil is dry give it some water. Tip: If you’re growing it in a pot, use orchid or bromeliad mix so it gets plenty of drainage. Give the plant a good watering at least once a week and fertilise with weak compost or comfrey tea once a month. A pinch of sulphate of potash around the base of the plant at the beginning of the second summer will help with flowering. In Australia, the major growing regions include South East Queensland, particularly the Sunshine Coast hinterlands, Maryborough and Wide Bay area, the Yeppoon district, and all the way up to Mareeba and Mosman in Northern Queensland. Did you know that Pineapples are one of the healthiest fruits around? Pineapple is a great source of Vitamin C! Just 100g of pineapple equals 98.6% of your Recommended Daily Intake (RDI*). Pineapples are high in fibre, and low in calories, sodium, saturated fats and cholesterol. Pineapples contain Bromelain which is an enzyme known for its ability to break down proteins making it great for digestion. They’re also a very good source of copper and a good source of vitamin B1, vitamin B6, dietary fibre, folate, and pantothenic acid. Floral arrangements are something that ‘s widely known and practised but what about other types arrangements? Could you have a living arrangement of plants that were brought inside for a little while then left outside to keep growing? Would they outgrow their pot or could you find plants that don’t need to be moved? Today, we’ve got the answer and this is like a living display but how and what plants should you use? Pick a couple or sculptural or architectural succulents and then fill in the spaces with spreading succulents such as sedums. 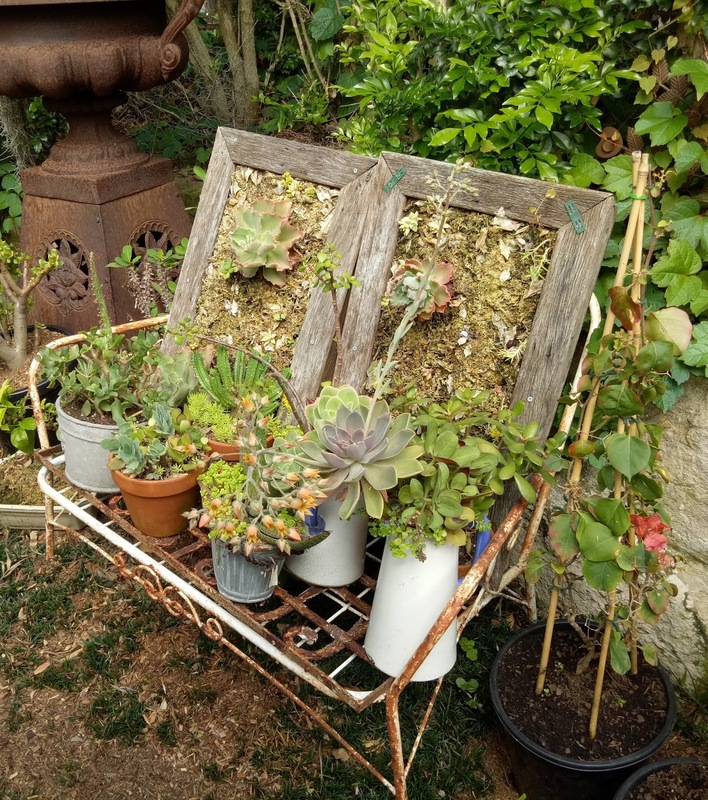 Rachel suggests Sedum “Green Mould” as a filler succulent and whatever takes you fancy, maybe Echeveria Topsy Turvy and another 1 or 2 architectural succulents to make your display. Wildlife in Focus presents a bird that collects blue things with Dr Holly Parsons; a couple of weeks ago we explained how to deal with bean problems and today we’re growing them in Vegetable Heroes; a stroll into a very unusual nursery in Plant of the Week and all about scented stock flowers in Talking Flowers segment with Mercedes. 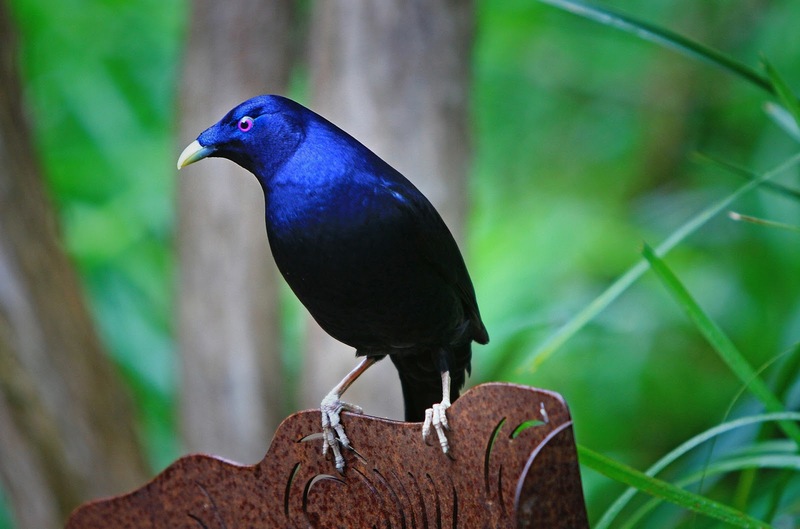 Listeners would probably have heard about the Satin Bowerbird with its glossy blue-back with a distinctly coloured eye. You may not know though that it takes up to five years before the satin bower bird male develops that full glossy colour. Before that it's an olive green. Satin bower bird is a medium sized bird, similar in weight to a magpie and has good colour vision especially into the blue and ultra-violet spectrum. So why does it prefer the colour blue to adorn the bower? Is the bower also a nest? Sorry for Tasmania and South Australia, because you guys are missing out on this rather unusual bird. The male builds that bower, a parallel row of sticks in a north south axis but that’s not where the eggs get laid, it just all about attracting the female with collected blue objects and a bit of dancing. 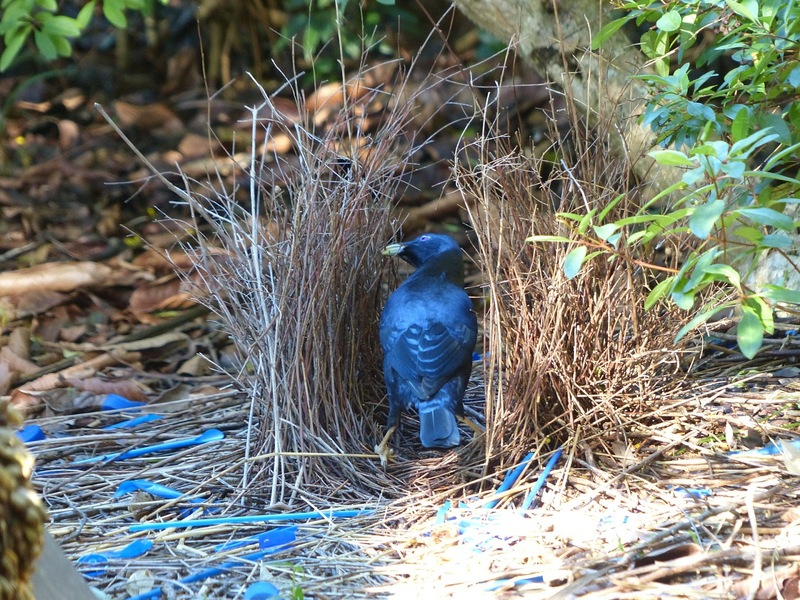 The female bowerbird gives the bower a good look through several times before making up her mind up whether or not she wants to pair up with the male. The bower of the satin bowerbird. The female bowerbird does the nest building which is made up of loose twigs some 30 metres above the ground. Just remember to snip the blue bottle tops before you throw them into the bin. If you have any questions, either for me or for Holly, why not email realworldgardener@gmail.com or write in to 2RRR P.O. Box 644 Gladesville NSW 1675. Do you love your beans? Did you know that beans have been an important part of the human diet for thousands of years? Bean pods can be green, yellow, purple, or speckled with red; they can be flat, round and a yard long. Beans are a legume in the Faboidea or the pea family. 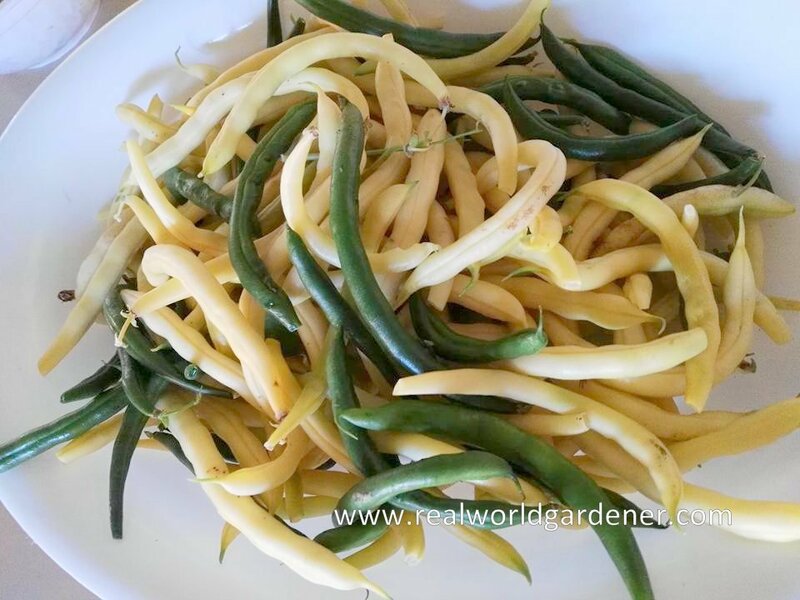 Growing beans is pretty easy and I would say essential in a veggie garden because beans, as well as other legumes, have nitrogen fixing nodules on their roots. Yep, that’s right, the roots make nitrogen out of the air and deposit it into the soil. Lightning storms are even better for that reason because they convert nitrogen into ammonium ions which is what plants need before they can take it up. Bean varieties originated from different places or countries. Green bean originated from Central and East Asia, North-eastern Africa and the Mediterranean. French beans appeared about 8,000 years coming from Latin American, Mexico, Peru and Colombia. The origin of the long bean was Southwest China. Spanish explorers took the green bean back to Europe in the 16th century and introduced it there. From there were spread to many other parts of the world by Spanish and Portuguese traders. Did you know that the Egyptians had temples dedicated to beans, and worshipped them as a symbol of life? Beans, either climbing or Dwarf Beans, are sometimes called Green beans are also called string beans and snap beans. To grow beans you need up to four months of warm weather. In subtropical climates beans can be grown almost all year. For temperate and arid zones, mid-spring through to late summer are the best times to plant. In colder districts, beans, don’t like the cold at all and they certainly don’t like frost. You have until the end of summer, certainly you wouldn’t be expecting any cold snaps now. Tropical districts, once again, need to wait until the winter months to sow beans. 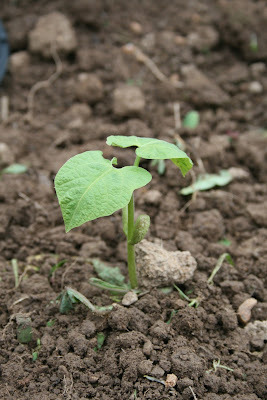 Beans are best planted at soil temperatures between 16°C and 30°C so planting them from now on is ideal. Sow your bean seeds about 2.5cm deep or depending on the size of the bean I guess. Sow your beans, either climbing or dwarf beans either in rows or just scatter so the seed are 5-10cm apart (don't worry about the odd ones which are closer). Cover with soil, potting mix, or compost and firm down with the back of a spade or rake. Grown this way the beans will mostly shade out competing weeds and 'self-mulch'. An important fact about growing beans is that they need well-drained soils with a pH between 6.5 and 7.0 and are sensitive to deficiencies or high levels of minerals in the soil-especially climbing beans. 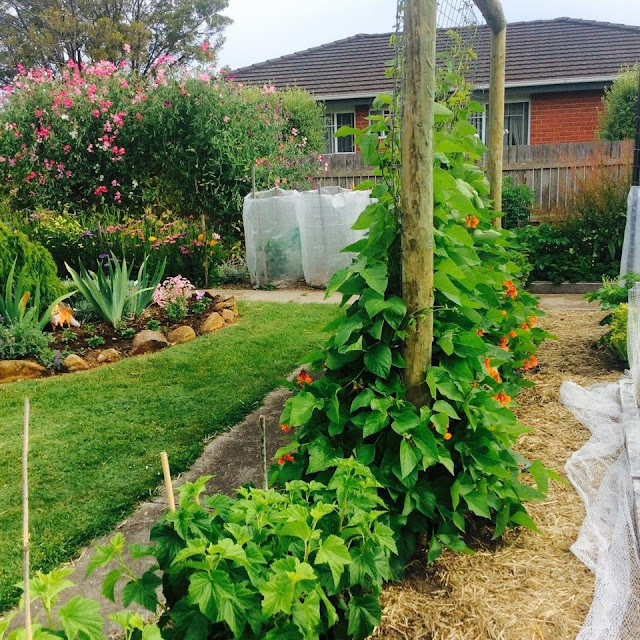 So make sure you spread some chook poo or cow manure before sowing your bean seeds. When growing green beans, keep the soil moist. A good rule of thumb is to put a finger in the dirt and if the dirt is dry up to the first knuckle, then it needs about an inch of water. Pods won’t set at temperatures above 270 C.
Did you know that if you pick the beans as soon as they’re ready, you’ll get new flowers? 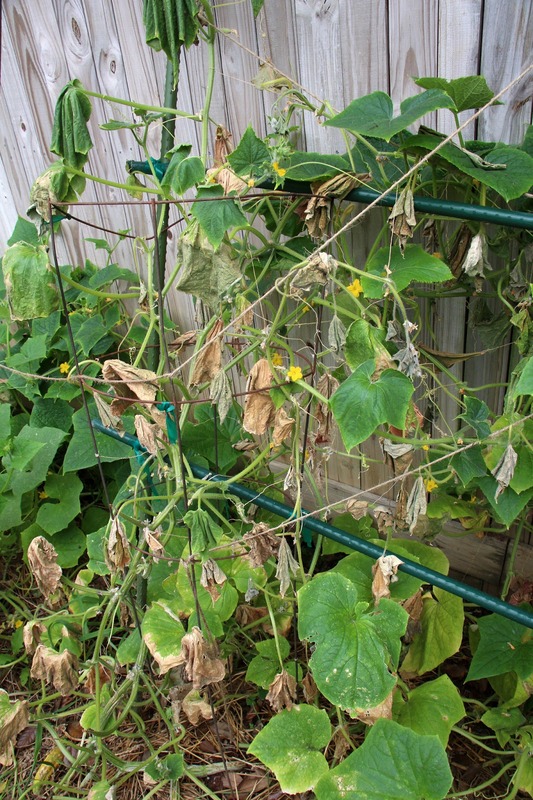 If you neglect your bean plants and let your beans get large and stringy, flowering will slow right down and you probably won’t get any more beans from your plants. Tip: To have beans all summer long, plant more seed as soon as the previous planting starts to flower. Protect against snails and slugs by laying down straw or sugar cane mulch and sprinkling coffee grounds around the edge of the veggie bed. Slugs and snails will completely destroy newly sprouted beans. Beans do poorly in very wet or humid tropical climates because they get bacterial and fungal diseases. Go easy on the fertiliser or you’ll get lots of leaves and no beans. When picking your beans, pick times when your plants are dry. Working with beans when the leaves are wet tends to spread any diseases. When are beans ready pick I hear you ask? Usually in about 10-12 weeks. Pick them when they are about as thick as a pencil, smaller if you want a better, tender taste. Barry emailed to see his beans had a bad aftertaste, why was that? If you leave them too long on the vine the chances are you’ll get that bitter aftertaste. That usually means that they are over-ripe, or they've been on the shelf a while. As they grow, the natural sugars in them convert to starch, which has a bitter taste. As soon as you pick them, the sugars start to convert to starch too. It can take a week or more for it to be noticeable. It will change the taste, but it doesn't make them unsafe to eat, just throw them in a pot of home made chicken soup or whatever. They taste pretty good that way. Green Beans are a good source of vitamin C and also contain calcium, magnesium, zinc and Vitamin A. But, the most important nutritional fact for beans is that they provide a major source of soluble fibre, which, when passing through the digestive tract grabs and traps bile that contains cholesterol, removing it from the body before it's absorbed. Also is a source of folate . Dwarf Snake Beans-ready in 11 weeks. Windsor Delight has long pods of about 15cm. Blue Lake Climbing, long pods again but they’re round this time. 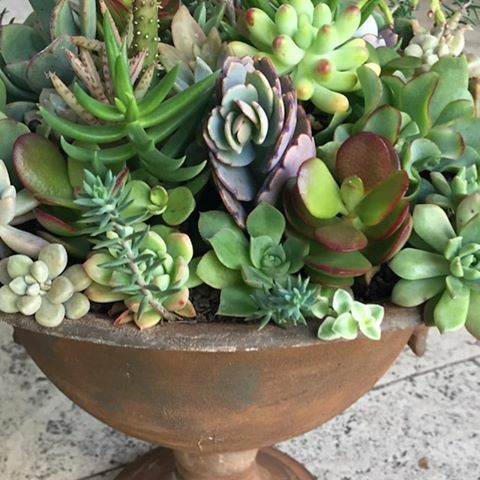 What kind of pots do you have in your garden? Are they just plastic, or perhaps some concrete, terracotta, or even hanging baskets with coir peat liners? Did you know, that before plastic pots, nursery people sold plants in either bare rooted, in terracotta pots, or "balled and burlapped" and intins? Any old tin would do presumable as long as it had a drainage hole and was cleaned. Today I’m about to take you on a fantastic journey with a nursery owner who goes beyond the plastic pot in her nursery. I'm talking with Rachel Gleeson, horticulturist and owner of succulent and bonsai nursery, Ivy Alley. Hopefully you’re inspired to use some unusual containers to pot up your plants. Definitely take a leaf out of Rachel’s book. Just a note about what I mention regarding burlapping a plant. This involved digging a plant from a nursery bed, taking as much of the rootball as possible and wrapping it in hessian to keep the soil intact and help prevent moisture loss. 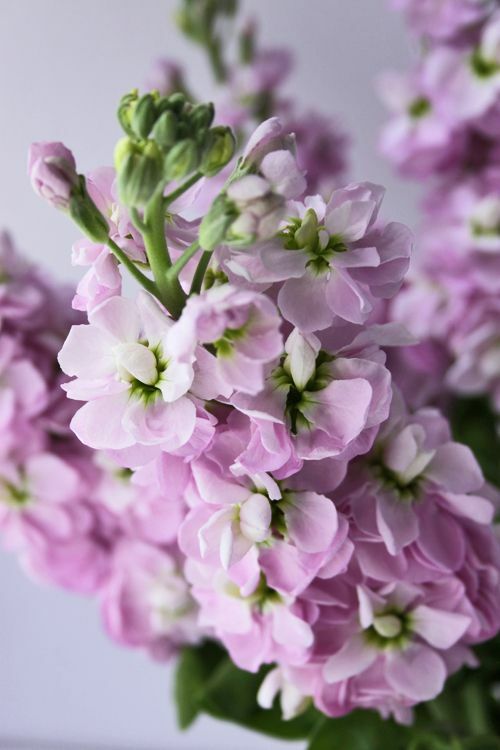 Stock flowers are members of the Brassicaceae family, so that's the same as broccoli, cabbage, brussel sprouts and cauliflowers. Did you know that you can eat the flower? Sow seeds of stocks into your garden beds or borders near where you will be able to enjoy the scent. They prefer sandy, well drained soil that's has a neutral pH to slightly alkaline. Plenty of added organic matter will help a lot to keep up the moisture in the soil. What they also need is for you to mulch well to maintain that moisture and feed with a balanced fertiliser before flowering. Stocks are a romantic looking flower suited for cottage gardens and definitely suit for the vase. Stocks come in an array of colours: burgundy, lilac, pink, cream and now salmon. Mercedes says Ms Stock (because it's grown from seed) needs to have the stems cut at an angle. Re-cut the stems every second day and place in shallow water. Ms Stock is highly ethylene sensitive and sensitive to heat. Buy your flowers 3/4 budded. Recorded live during the broadcast of Real World Gardener on 2rrr 88.5 fm in Sydney, Wednesdays 5pm. Fixing bean problems in Plant Doctor, Growing something unusual and salty in Vegetable Heroes; grow this palm instead of the weedy Cocos palm in Plant of the Week and all about Agapanthus in the Talking Flowers segment with Mercedes.? Beans are such an easy crop to grow, but if you live in a district where the weather plays havoc with your veggie garden, you could be in for a bit of trouble with your beans. Perhaps it’s not just disease but a horde of insects have descended. Let’s find out what you can do about this. Whitefly, thrips and aphids control with eco oil or soap based spray to. Beanfly, is much harder to control, is cultural. If you don't pick off affected leaves, the eggs will hatch and the larvae will tunnel into the stems of the bean plants. You may as well pull them out at this stage as there is no control. Caterpillars can be picked off or use Dipel. 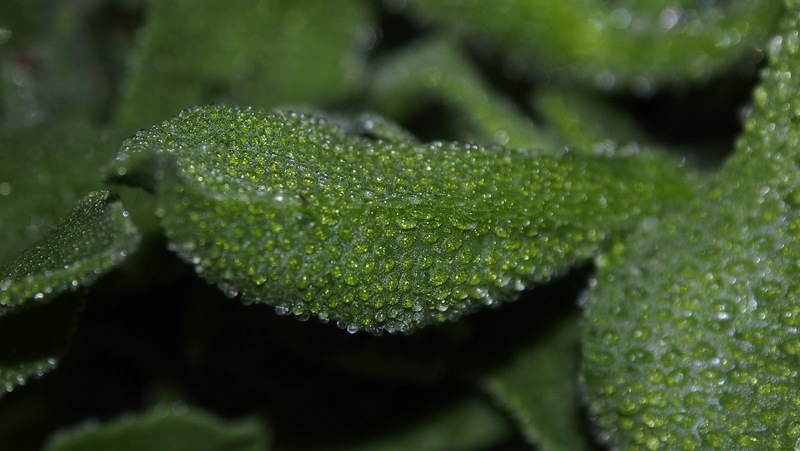 Powdery mildew can be controlled with potassium bicarbonate spray such as eco Carb. 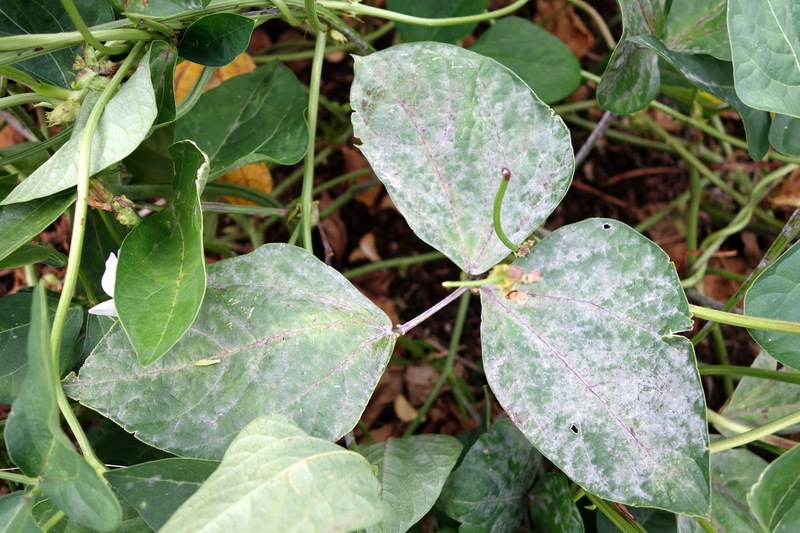 Other diseases, such as rusts and leaf spots is better prevented with cultural methods because chemical control is difficult and mostly ineffective. Good sunlight is best for beans so not near overhanging trees. No pods but plenty of flowers? The main reason for no pod set is very hot weather. Steve says, just be patient and wait for the weather to cool. Of course, encourage pollinators into your garden with plenty of flowers near your veggie bed. If you have any questions, either for me or for Steve, why not email realworldgardener@gmail.com or write in to 2RRR P.O. Box 644 Gladesville NSW 1675. A succulent in vegetable heroes? Native to Europe and Africa but has naturalised in the Southern parts of Australia, extending as far north as Exmouth on the Western Australian coast. According to CSIRO Mesembryanthemum crystallinum is found on wide range of soil types, from well-drained sandy soils (including sand dunes), to loams and clays. Salty Ice Plant isn’t fussed about soil pH and can even tolerate nutritionally poor or saline soils. “In the natural state, Salty Ice plant or M. crystallinum appears to be tied to climatic factors, and is most common in years of relatively high winter-spring rainfall. Why should you grow this Salty Ice Plant? As far as the home gardener goes this plant is rare and exclusive. It’s highly ornamental, has a creeping or prostrate growth habit and is great in a pot. It’s very attractive and can withstand environmentally tough conditions, plus the glistening succulent leaves look like they are covered in frozen icy bumps. Flowers open in the morning and close at night, and are insect pollinated. The Ice Plant has a tendency to go a pinkish or rosy-red colour in hot dry conditions and this, in itself, makes it an attractive plant. The fresh sap of the Ice Plant was found to be a great remedy for all manner of skin complaints and could be added to baths or extracted and made into ointments and creams. It’s not just another succulent that’s growing in your garden but you can use it in cooking. It’s a fact:Salty Ice Plant is the ultimate salty garnish chefs use for fish dishes and to balance sweet flavours. Botanically speaking it’s also quite novel because it seems to be able to switch between two modes of growing. I need to mention here that your normal every day tree shrub or groundcover is what’s termed a C3 plant. That means it needs sunlight to carry out photosynthesis which it converts to sugars, taking in carbon dioxide and giving off oxygen. Salty Ice plant grows like this when conditions are good meaning there’s plenty of rainfall. 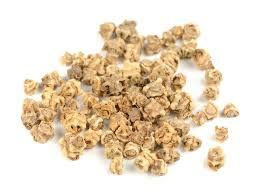 Another method that plants can grow by is called Crassulacean Acid Metabolism or CAM for short. CAM plants shut their breathing pores or stomata during the day but open them at night to take in CO2 which is stored. This CO2 is released inside the plant during the day and even though the breath pores are closed, it can carry out photosynthesis. Also, as the breathing pores are closed, that means that water loss is minimal during the heat of the day. Plants that can do this are very drought tolerant and plants that can switch from one mode of photosynthesis to another are pretty exceptional. For Salty Ice plant, it switches to CAM metabolism when it experiences salinity and drought. So how come it’s called salty ice plant? What makes it glisten in the sun? 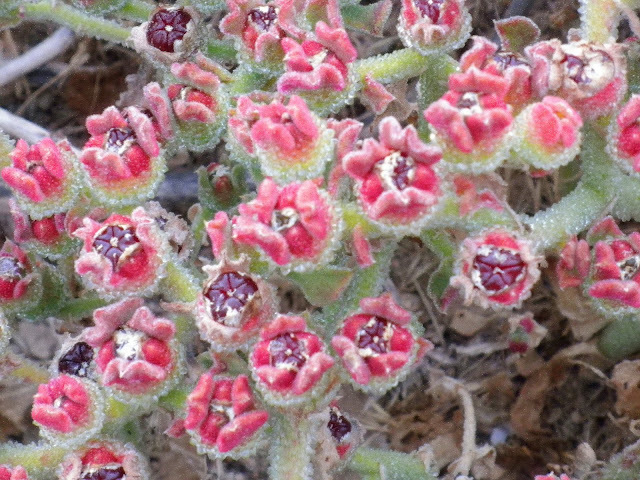 Mesembryanthemum crystallinum accumulates salt throughout its life, in a gradient from the roots to the shoots, with the highest concentration stored in epidermal bladder cells. Epidermal cells are just below the leaf’s surface and it’s these bladder cells with the stored salt that give the leaves that glistening ice crystals look. Bladder cells glisten in the sun on salty ice plant. There’s a few uses for salty ice plant. Firstly the leaves of M. crystallinum are edible and the seeds can also be eaten. Secondly, and perhaps more unusual, the crushed leaves can be used as a soap substitute and has some medicinal uses (Plants For A Future - Species Database, 1997-2003). In all districts the best time to sow the seeds is in Spring. Sow the seeds in punnets first only just covering the seed and put them in a plastic container, or in a mini-greenhouse. When they are large enough to handle, prick the seedlings out into individual pots and plant them out after the last expected frosts. You can easily grow Salty Ice plant in any ordinary well-drained garden soil. Salty Ice plant won’t grow in shade can grows in soils that aren’t that fertile such as sandy soils. It’s not very hardy in cool temperate climates and will be killed even by a light frost. Plants have few problems with pests or diseases though as I mentioned the young plants are prone to root rot and damping off unless given plenty of ventilation and dry growing conditions. 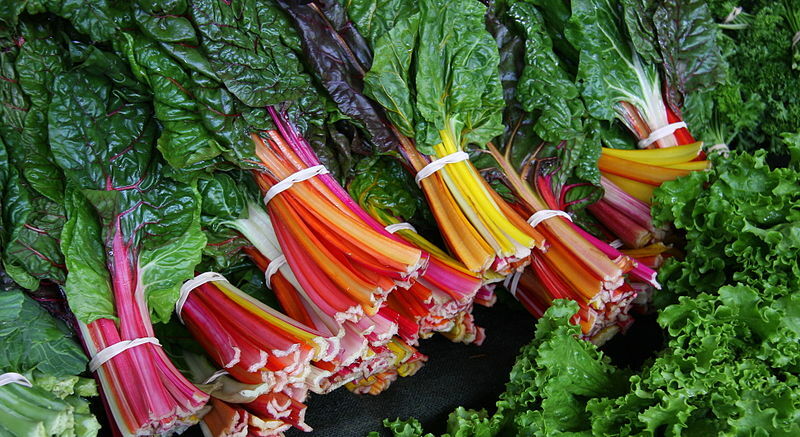 TIP: Leaves and stems - raw or cooked. They can be used as a spinach substitute. The leaves have an acid flavour, they are thick and very succulent with a slightly salty tang. They can also be pickled like cucumbers or used as a garnish. 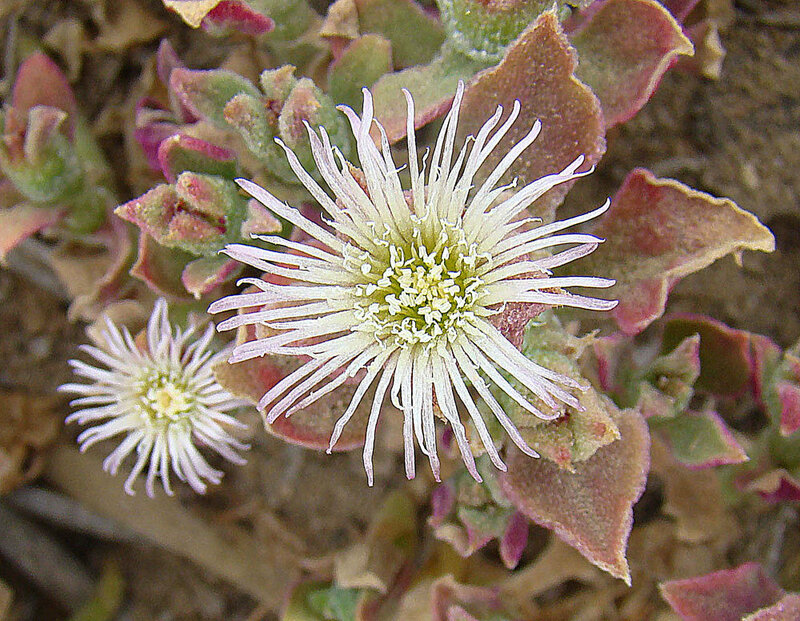 Common ice-plant (Mesembryanthemum crystallinum) is a significant environmental weed in Victoria, South Australia and Western Australia, and an environmental weed in Tasmania and New South Wales. So if you intend to grow it in your vegie or herb garden, make sure it doesn’t set seeds. The fresh sap of the Ice Plant is apparently a great remedy for all manner of skin complaints and could be added to baths or extracted and made into ointments and creams. Juice extracted from the leaves are astringent and mildly antiseptic. You can mix the juice with water and use it as a gargle to relieve laryngitis, sore throat and mouth infections. Do you love or hate palm trees? The gardening community is divided into two groups, those that love the palm trees and those that hate them. Probably because people persist in growing the environment weed, the cocos palm, which although grows really fast, is particularly ugly. 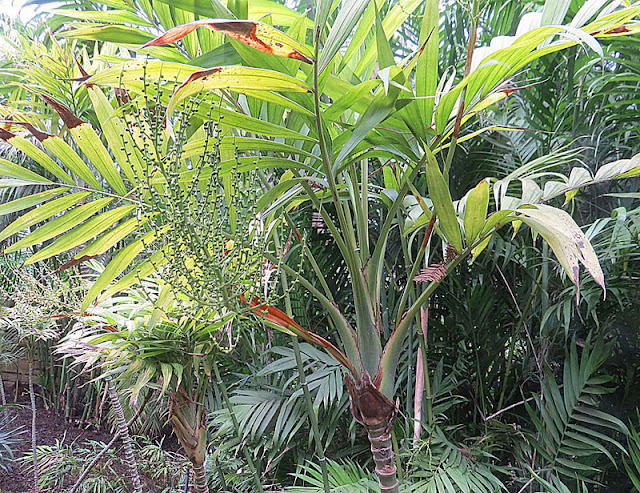 You can keep the parlour palm indoors for many years, but planted out in the garden under other leafy palms or larger leaved shrubs, it grows as a bushy alternative to the single trunks of most other palms. If it gets too tall for the room, give it a trim because being multi-branching, there's no risk of killing of the leader. Plus, you don’t have dropping palm fronds like you do with cocos palms and a few others. You can see straightaway why Agapanthus has the nickname ‘flower of love’. The Greek word ‘agape’ means love, and ‘anthos’ means flower. How to pick your Agapanthus flowers for the vase. 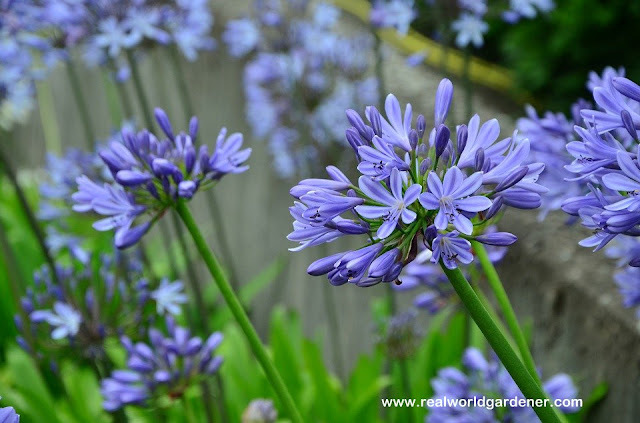 Agapanthus flowers are normally picked when the bud bract has fallen off and no more than three florets are open. Stalks are cut near their base with a sharp knife. Remember what Mercedes says: If it's from a bulb, rhizome or cor, then it's Mr Agapanthus. Mr Agapanthus wears sneakers, so we cut the stems straight across the bottom of the stalk. If you don't want the pollen to drop onto your tablecloth, cut off the stames before they "fluff." If you're buying Mr Agapanthus, make sure that flowers are of proper maturity. If the neck of flowers is bent upward, they have been transported at warm temperatures and have responded to gravity. Cut off the old flower spikes after the flowers fade and before they begin to dry and set seeds. Snip through the stem with shears near its base, where it emerges from the plant. 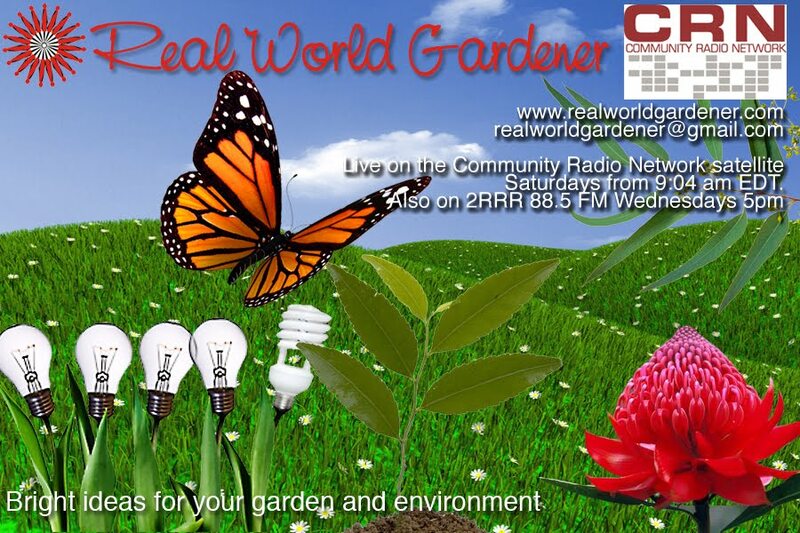 Recorded live during broadcast of Real World Gardener show on 2RRR 88.5fm, Sydney. 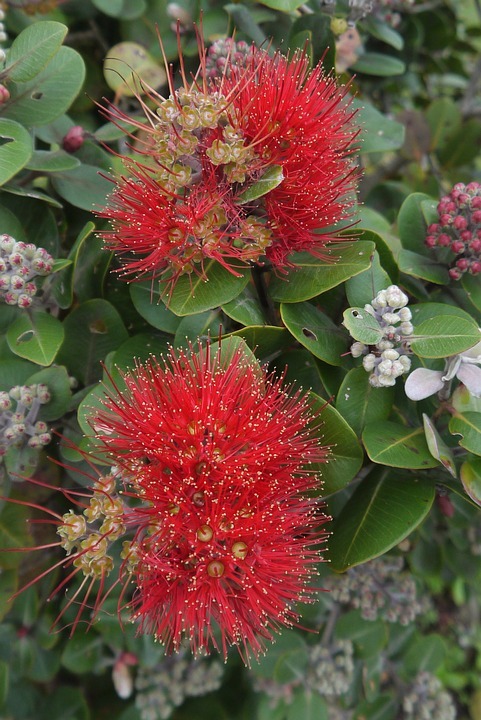 What’s the link between NZ and Australian plants we ask in the Garden History segment? Growing a summer type of spinach in Vegetable Heroes; , plus a which is the best flowering gum in Plant of the Week and more floral happenings in Talking Flowers segment with Mercedes. You may not know that Australia was once joined to New Zealand. Does this explain some plants that are similar because they were left when the continents drifted apart ever so slowly? Or was it the fashion of the day to bring over plants from other countries when the colonials started setting up their ornamental gardens? 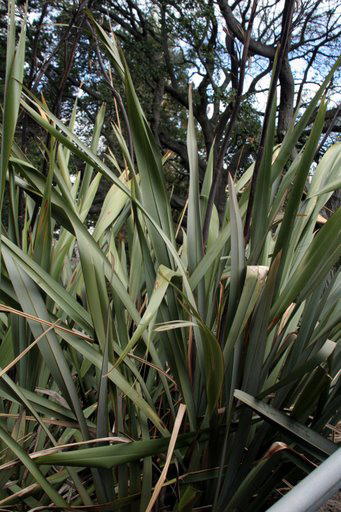 Let’s find out why NZ plants have made their mark. I'm talking with Stuart Read who’s a member of the National Management Committee of the Australian Garden History Society. New Zealand plants it turns out, mostly came across to Australia in the 1800's. 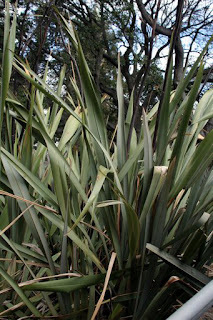 Phormium tenax, or New Zealand flax plant is one example; this plant remains fashionable today because of its sculptural qualities that fit into modernist homes. Apart from failing to learn the techniques of rope making using flax, gardeners even today, use this plant far and wide, not just in Australia. Cordyline australis or Palm Lily is another example, called Torquay palm in England because they think it's theirs. The australis part of the scientific name reflects that it is from Australia, but in this case means "of the south" in a general sense. Cabbage tree or palm lily has an exotic look and the buds of which were cut off and used as boiled cabbage. Having more than one growth bud, it didn't kill off the plant. Stuart remembers how the streets were lined with NZ Christmas bush where he grew up. Plants in the myrtle family have many similarities, for example, Pohutakawa or NZ Christmas bush has the same type of flowers as our lilly pillies and bottle brush. If you have any questions, either for me or for Stuart, why not email realworldgardener@gmail.com or write in to 2RRR P.O. Box 644 Gladesville NSW 1675. SILVERBEET or Beta vulgaris is grown as a leaf vegetable in Australia. Did you know that although the silver beet leaves are eaten like spinach, the stems may be cooked like celery? The seedlings can also be served in salads. Although it looks like true spinach (Spinacia oleracea L.), silver beet has a larger, coarser, milder tasting leaf. It is also more tolerant of cold, heat, drought and disease. As silver beet doesn’t easily go to seed during hot weather, it is grown in summer. Did you also know that what’s sold as perpetual spinach, whether plants or seeds, is actually a type of silverbeet? Perpetual Spinach is called that simply because it looks like and tastes similar to real spinach and so that name has become the norm for over a century. The scientific Name is Beta vulgaris subsp. vulgaris. Whereas, true spinach is Spinacia oleracea. Silver beet, a leafy relative of beetroot, comes from the coasts of Portugal, Spain and the Mediterranean islands. From there it spread to Britain and then to Australia and New Zealand. The stems can be white, red, pink, orange or yellow. The leaves may be smooth or crinkled. Leaf colours vary from light to dark green to deep red. In general, the paler the leaf colour the milder the leaf flavour. 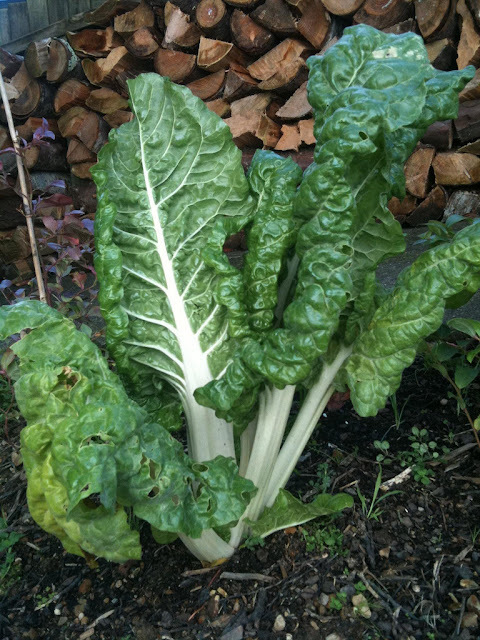 Silver beet is a biennial plant meaning it should last for a couple of years in your garden. In the wild it grows leaves in its first season and produces seeds in the second season after germination. Silverbeet prefers a shaded aspect that is sheltered. Although it copes with strong winds, they can cause some leaf damage. Will It Grow In A Pot? If you want to grow Silverbeet in a pot, it must be quite deep, so a tall pot would suit quite well. Silver beet does well in a wide range of climates, even in sub-tropical, temperate and cold temperate climates. Fordhook Giant and Fordhook have broad, white stems and heavily crinkled, dark green leaves. Both these varieties are grown over the warmer months. Silver beet can be direct sown or transplanted. Silverbeet Seeds are Knobbly. Why? Did you realise that the light brown, knobbly thing in the silverbeet packet, has two to six seeds? That’s called a cluster seed, which is actually a dried fruit. 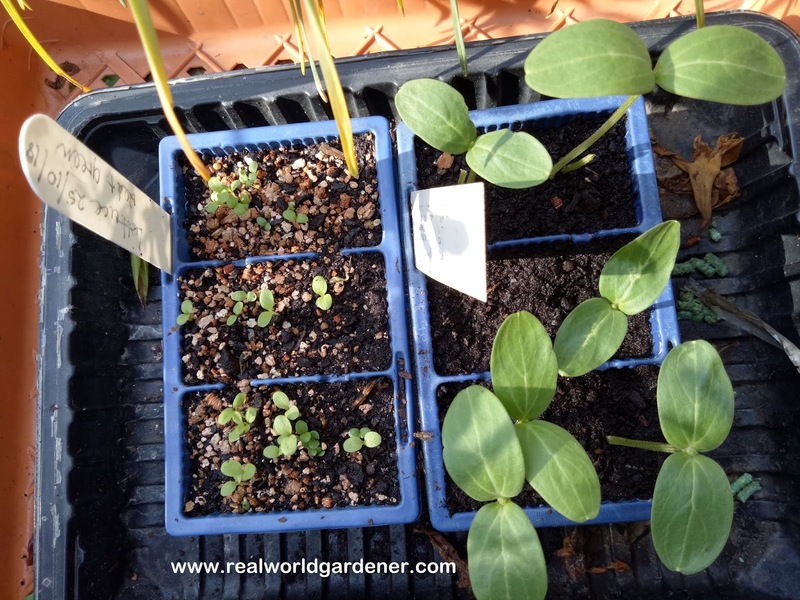 The cluster seed is sown ½ cm deep in the soil or into seed trays for transplanting. Don’t let the soil or seed raising mix dry out until the silver beet seedlings emerge, usually in about 10 days. Thin them out when the silverbeets are 5cm high and use the thinned out seedlings in stir fries. Silver beet needs plenty of nitrogen and water for the fast growth of large, well-shaped, tender leaves. Commercial growers often enrich their soils with large quantities of animal manures, composts or green manures. That means, alfalfa or lucerne is grown first to put lots of nitrogen into the soil with their nitrogen fixing nodules. Don’t use fresh animal manures because the animal manures need to be composted to avoid spoiling the silver beet leaves with food poisoning micro-organisms. Applying some blood and bone fertiliser before sowing gives silverbeet crops a good start, especially on sandy soils. Here’s another interesting fact about silverbeet. Did you know that the leaves are 93% water? If you’re growing it in full sun, your plant will probably wilt in the summer heat. That’s because it might stand up to summer weather but it’s not drought-resistant. Keep it really well watered to prevent wilting. Don’t worry if you come home and find it flopped over, it will recover after watering. Sprinkler irrigation is the preferred method for silver beet as it encourages leaf growth. However, good irrigation timing is needed to prevent leaf diseases from occurring with sprinkler irrigation. The one fungal disease I have noticed on my silverbeet crop is called Cercospora leaf spot (Cercospora beticola Sacc.) and is the most common fungal disease. It produces light grey spots with brown margins on the older leaves. These spots fall out and create holes in the leaves. The disease is favoured by high temperatures (24° to 30°C), high humidity or long periods of leaf wetness. Cercospora leaf spot comes from several different ways into your garden. It could be from diseased host crops or weeds growing near the silver beet, the environmental factors I mentioned, or a slight possibility that it was from infected seed,. If you do get this problem, don’t grow silverbeet in that spot for another 3 years. Silverbeet can be cut and come again with multiple pickings. The outer leaves are picked by pulling them down to 2.5 cm above the plant base, leaving the central leaves behind. Pulling rather cutting the outer leaves reduces the amount of leaf damage in later pickings. Silverbeet is ready in about 8 weeks and when the leaves are about the size of a ruler, ie, 30cm long. Why is silverbeet good for you? vitamin A rich foods are great for a smoker or passive smoker. Eating a diet rich in Vitamin A may reduce the chances of developing lung inflammations. Silverbeet is also rich in folate (folic acid), zinc, copper, vitamin C, dietary fiber, and vitamin E.
Would you like a tree that provides you stunning colour that you could also cut for your vase? A tree whose flowers cover the leaves like a coloured blanket? Better still, these trees don't grow much over 3 - 5 metres in height. Of course you do, and if you have thought of it before, you’ll definitely want to grow this after you hear why it’s so good. The Plant Panel recommends that if your tree is suckering like Karen’s one, keep removing the suckers with secateurs, otherwise they will take over and possibly result in the death of the upper part, which is the scion. TIP: When you plan to purchase a grafted eucalypt, make sure you check the graft union so that the top and bottom is equally matched. Mercede's definition of a bouquet of classic cut flowers is 'high end' cut flowers. Think Ms Hydrangea, Ms Stephanotis,Mr Tuber Rose. It's not just flowers though, there are berries that are incorporated into a bunch of classic flowers. Try Ms Hypericum: red or green berries. 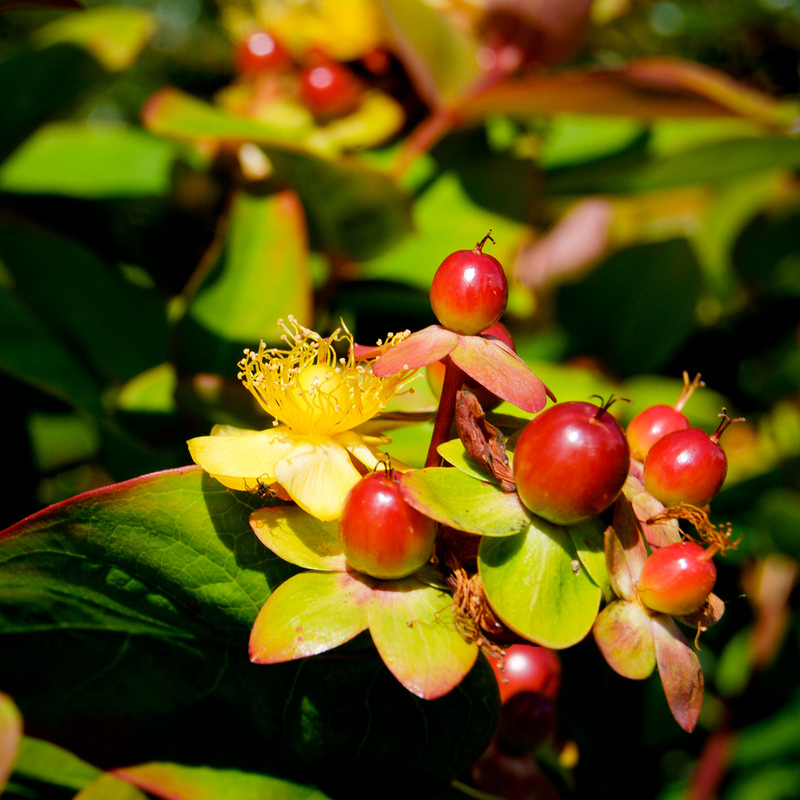 Hypericum androsaemum, also referred to as Tutsan, Shrubby St. John’s Wort , or sweet-amber, is a flowering plant in the family Hypericaceae. It is a perennial shrub reaching up to 70 cm in height, native to open woods and hillsides. Also suitable are Ms Crab -Apple. Some florists say the perfect bouquet consists of crabapple, pepperberries and red/orange roses. Slit the woody ends and then soak them in a bucket of warm water for 3 to 4 hours so they can absorb as much moisture as possible. Strip off any leaves that will be under the water level in their container, fill it up with more water and place them in a cool, dimly lit room until the buds swell and begin to show color. Ms Stephanotis is a high end cut flower.